Bring a bit of green to even your tiny spaces with Meredith Franzese and Daniel Dundin sweet vase. You know about tree houses, but have you ever seen a blossom house? It's slightly smaller but just as enchanting. This miniature birch "blossom home" has a unique chimney: a glass bud vase for a single stem or bit of greenery. Inspired by the movement to simplify and downsize our lives, Meredith Franzese and Daniel Dundin created the small, sweet vase. 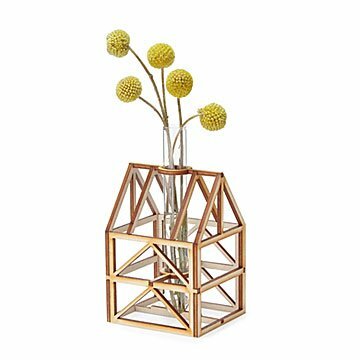 A great gift for mom or an imaginative friend, the beautiful, functional piece brings a bit of magic to spaces big or tiny. Handmade in New Jersey. Sister and brother team Meredith Franzese and Daniel Duden approach their craft from two very different perspectives. Meredith prefers contemporary home design, while Daniel adores 19th century style. After traveling the world and gathering tons of inspiration, the siblings decided they should put their ideas together into fresh, unique pieces. Their collection is unified under that idea that: When we have less "stuff," we generally feel more free. They take pride in making tiny things that have a big impact. Today, Meredith and Daniel create small, architectural designs in Lambertville, New Jersey. Dust wood with a dry cloth. Wash vase with soap and water.